Do you have ancestry in the Port Phillip region? 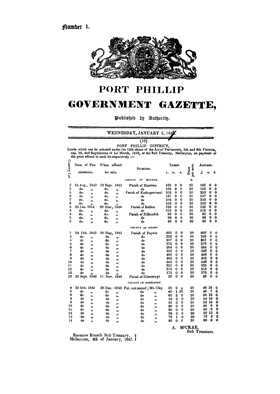 A precursor to the colonial Government Gazette, the Port Phillip Gazette offers similar information to the Government Gazettes for each of the Australian states. Government Gazettes are a unique, useful and extremely fascinating resource for local, family and social historians and researchers in other fields throughout Australia. They were published by the government as a means of communication to officials and the general public and therefore contain information that is of great use in establishing an image of the colony of Port Phillip and its people in the past. Included is a range of information such as land transactions, legal notices, notice of acts, insolvency and bankrupt notices, impoundments, absconders, deserters and missing people, partnerships, licences, contracts, government institutions and positions, statistics and much more. They have information covering a broad spectrum of the community with important details and facts on thousands of people - making them a valuable genealogy tool for anyone exploring their family history or building a family tree.